I hear via a couple of attractive grapevines, that you are having trouble writing. God! I know this feeling so well. I think it is never coming back—but it does—one morning, there it is again. About a year ago, Bob Anderson [the playwright] asked me for help in the same problem. I told him to write poetry—not for selling—not even for seeing—poetry to throw away. For poetry is the mathematics of writing and closely kin to music. And it is also the best therapy because sometimes the troubles come tumbling out. Well, he did. For six months he did. And I have three joyous letters from him saying it worked. Just poetry—anything and not designed for a reader. It’s a great and valuable privacy. I only offer this if your dryness goes on too long and makes you too miserable. You may come out of it any day. I have. The words are fighting each other to get out. 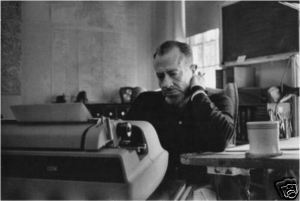 Photo: John Steinbeck at work. Prints available at ebay.com.